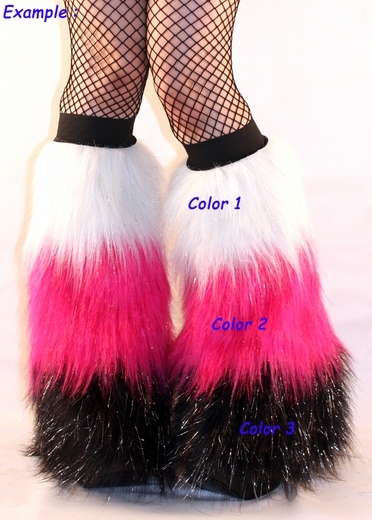 Home : Furry Leg Warmers : Custom - *GLITTER* 3 Tone - Pick Your Colors! Custom - *GLITTER* 3 Tone - Pick Your Colors! Choose your colors, make your own combination, be creative! Our Fluffies are super long and flared, they have a stretchy elastic band sewn at the top (can be worn shown out or hidden - tucked in) To keep them from slipping down while you�re dancing, walking, running or plainly partying the night out at the club. They're one size, about 19 inches long (Stretchy elastic will Fit most calfs, let us know if you think you might need custom size or length).